Discussion in 'Our Firewood Forum' started by Dustin4185, Jan 25, 2019. We just got a new JD5115M, 115 HP, 4wd, open station, FEL with third function. Total weight is around 12,000 lbs as is. We burn a lot of wood at work and the house and I have a little money left in this equipment budget. I am looking at getting some sort of grapple bucket and possibly a skidding winch. We will probably use this to thin some stands on the WMA along with other things like vehicle recovery. First, does anyone have any experience with BOTH a root grapple (smaller tine spacing, flat bottom, thinner tines) and a grapple rake (curved, thick times)? We ha e some fields with bigger rocks that come up every now and then but we also need to move tree tops and trees in the fields. Will a root grapple do both jobs? Second, what size winch would I need for this tractor? I was looking at Hud-son website and looks like the Uniforest 85 is the biggest, but I believe the 65 would work fine. Other than them, who else deals with these types of winches, preferably on the east coast? What other brands are out there besides Farmi? Dang, nice rig! 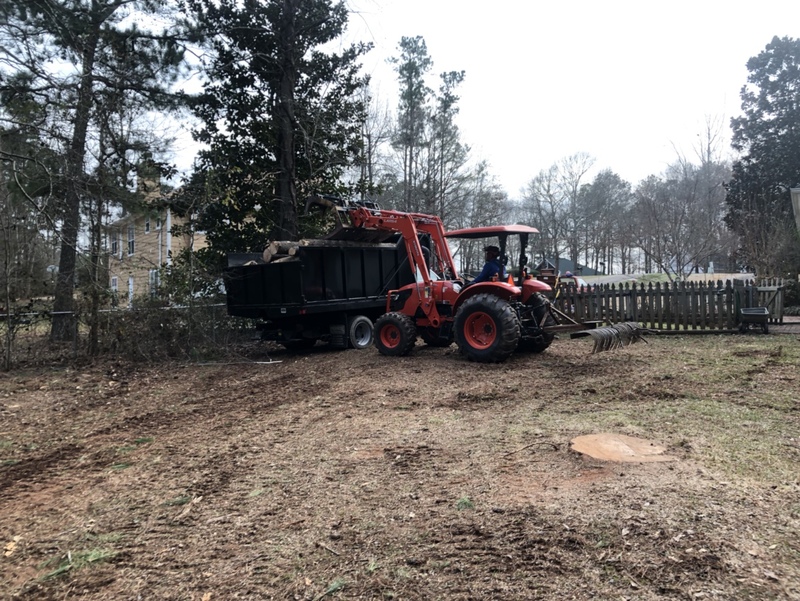 I don't have any grapple experience, but the guys at everything attachments in NC would be worth a call, they could give you pretty good details about pros and cons of both. Other brand names to look okay in winches would be Igland/Norse, Uniforest, Wallenstein, Tajifun, and Fransgard. @XP_Slinger just bought a super nice looking Uniforest, maybe he'll chime in. Mine's not "super nice" anymore, just that faded yellow, beat around the edges, well-used winch that's been in the woods where it belongs, and boy oh boy does the uniforest belong there. I bought mine from Hud-son many years ago now. Good folks to deal with. I work alone often but couldn't afford a radio remote but if I had to buy another winch it'll be a uniforest again and with the remote. Getting back up or down the hill when working by yourself gets old, fast. Also great for getting the tractor unstuck, and the remote would be the bees knees when needing to put a line on a tree you could control while making felling cuts. That said, I don't think there are any of the well known brands out there making duds these days. XP_Slinger, Dustin4185 and Ryan Browne like this. I have talked to them some about this and for pricing. They don’t offer a rake online, but I think they are a CID dealer (the root grapple comes from there anyway) so they may be able to get one. Blue Diamond is made just down the road from me in Knoxville, but won’t sell direct to us and the dealers wasn’t to jack the price up 40%! The Uniforest looks great, especially if I could swing the remote! XP_Slinger and Ryan Browne like this. Nice machine. I have an Igland/Norse and am happy with it and the price. Nice thing is that you can add remote control later, which is what I plan to do to spread the cost out. Not sure about rakes but I have CID extreme forks and they are stout. I have a tiny B2650 cab. My most used attachment recently is a 60” Land Pride 6060 grapple. Drop trees, buck them, and pick up the pieces with the grapple. For smaller stuff I just grab a bunch. You have a third function already installed for the front? Another thing to factor in to cost. Yes it already has third function (with full flow detent for augers). I have enough left for a grapple. The winch may have to wait. I found a hydraulic winch from the front of a fire plow dozer, but it doesn't have the cable capacity a true skidding winch would. I could fab one with it if it had a decent capacity. XP_Slinger and LOMartin like this. Lots of people seem to like the Everything Attachements grapples and I believe they’re making an even larger unit for your size tractor. I bought my Igland used. Easy to work on or repair if need be. Maintenance is fairly easy. Decide how you want the spool controlled. I chose a winch with a simple mechanical stop......the spool has teeth on one side and you can engage the spool lock/ratcheting piece easily. Others use some form of clutch mechanism to keep it from releasing. You could use one larger than mine, but they are similar. If you aren't too far away come by, you're welcome to see how it works.....I should be using it this weekend. Yes, I'm behind on firewood. I did a thread on AS, search for igland with the same forum name. Lots of others chimed in. XP_Slinger and farmer steve like this. Bought a lightly used Farmi 15 years ago. Works great! Very rugged construction. IMO you would have to really abuse it for a long time to damage it. Any thoughts on frostbite grapple? I looked at those, but we need one wider for brush. We found a JD dealer that could save us quite a bit on a new Frontier grapple. Supposed to be in next Friday. Does that tractor take DEF? I’ve been pondering a new one for tax purposes and was looking at a 5100M and 6105M. Yes, unfortunately. BUT, according to the service guys at a well respected dealer, one with DEF is better than one with just a DPF alone. I think the 75HP and below are DPF only and above is DEF. I've been happy so far now that I straightened some things out with the dealer I used. I will say that Meade helped me work out the issues I had with Ritchie, so I bought the grapple from them. This tractor pulls well for as light as it is. We put in some firelines with an Athens offset disk before it started raining again. Tires are loaded, but I ordered a full set of rear wheel weights. Contract price for this tractor with loader was $65,900. I bet Meade would sell one close to that. XP_Slinger and mdavlee like this. If either of those tractors are like my Deere wheel harvester you’ll hardly use any DEF I’m at 5 gallons a week running hard 10 to 12 hours a day. Jeff Campbell is who I dealt with and who another WMA bought a 61xxE with cab/loader from. Deere corporate made me use my closest dealer for contract until I made a claim that they intentionally overcharged. Deere caught it on the tractor for a savings of $3800. It was clearly written in their contract with the state. They were trying to charge that for setup and delivery. Then on the grapple, which was also on contract, he jacked retail up on his end. The salesman didn’t know I had the current price list that the discount was based off of. Tried to get us for another $1200 on it! I got it from Jeff for $225 less than contract because of their buying power. He is at the Greenville store. XP_Slinger, Dub11, Hinerman and 2 others like this. I have another piece of DEF equipment. It doesn’t use as much as my truck does! That’s crazy. Greeneville is the closest store to me. Abingdon is an easier drive to haul a tractor. View attachment 161352 We just got a new JD5115M, 115 HP, 4wd, open station, FEL with third function. Total weight is around 12,000 lbs as is. We burn a lot of wood at work and the house and I have a little money left in this equipment budget. I am looking at getting some sort of grapple bucket and possibly a skidding winch. We will probably use this to thin some stands on the WMA along with other things like vehicle recovery. 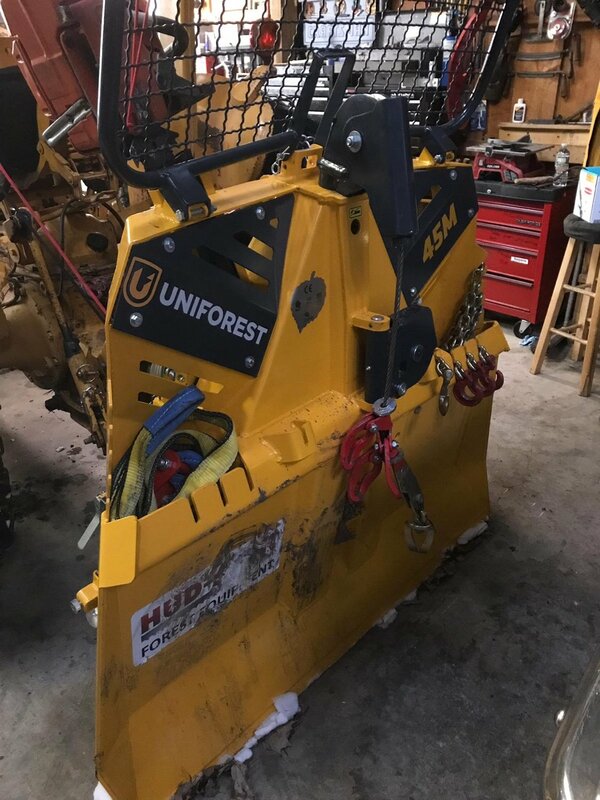 This is my 70hp that I use with a Solesbee’s 72” Brush Grapple: they now call them Grapple Rakes. This one new was $2,800. I’ve got a buddy that runs 95hp skid steers that has destroyed the more economical Grapples. Understand they are ok for smaller machines, but you don’t have a small machine. He is probably going to but my Solesbee’s because he is tired of the cheaper ones failing on him. I’ll explain why mine is for sale in a moment. As you can see, I run a Utility tractor for my Tree Service. I’ve asked Solesbee’s to build a Log Grapple. The flat bottom Brush Grapple is great on a Skid Steer, but it becomes challenging to see well when put on a Utility Tractor. We’ve owned other Solesbee’s Grapples for over 20 years using them on Case Skid Steers. Grandfather bought the 2nd one they built. What’s a Log Grapple you say? Young’s Welding calls them a Root Grapple, but it’s a similar concept. I’ve been after Travis with Everything Attachments for over a year to build a Wicked 74” or 78”. Reason being, the 66” is the largest they offer with the full length lid, & I don’t like running over stuff, mashing it into the ground. I want a grapple as wide or preferably slightly wider than my tire tracks so I can get everything in the path. You will too on that machine. Solesbee’s is considering building me what I’ve described. Mr. Young out in Kansas doesn’t want to build a 78” Unit because he’s set up for the 84” model, hasn’t sold nearly any of the 72” models, & recommends I go with an 84”. Dump trailers are 83” wide on the inside & I don’t want an 84” anyway. Tell them you want a 78” single lid strong grapple like I just described. I need a bit of support here. Why not just go with another make? The lighter weight Grapples will come apart on your machine just like they have on others. See my Barrett Brother’s Uniforest 45- I’d go with an 85 on your tractor. I’m going with the 65H for my machine. XP_Slinger, chipper1, LOMartin and 4 others like this.